u can add ginger garlic paste.can use fresh green chana which we eat raw.Please grease oil in the pan completely so that rice will not stick into the bottom of the pan. Soak rice in water for 15 min.Then drain the water. In a pressure pan,heat oil & add onion and saute them. Add haldi,green chilli,ginger,tomato & tomato puree till tomato becomes slightly soft. Then add Rice,soaked kala chana, dania powder, jeera powder, Chole masala, Garam masala and Salt. Add the soaked chana's water(only 1/2 cup i got) and add the remaining water. Close the lid of the pan and keep 3 whistles. 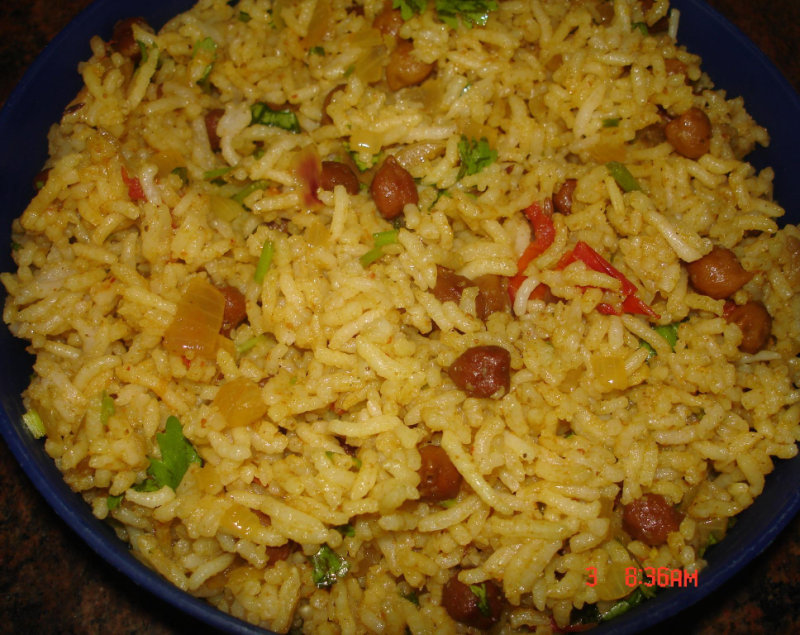 Chana rice is ready. Squeeze lemon in the rice and mix it well with coriander leaves. Note:can make chana mixture seperately in kadai and add it to rice.If u make this with kabuli chana,grind half of chana in mixer for more tastiness.If u soak more water in chana then u can adjust the water accordingly while boiling the rice. I am glad, I tried this recipe, that indeed became party saver of the day.